The change rhetoric is one of the most popular during any election, including Ukrainian ones. The incumbent president, Petro Poroshenko, won the previous election with the slogan “Let’s live in a new way.” Nowadays his opponents, using the disappointment and anger of the Ukrainian people, aren’t neglecting the tradition and continue to promise a new life under their future presidency. Volodymyr Zelensky, a popular Russian-speaking showman, is one of the newest. He has not been involved in Ukrainian politics before, and his inexperience in fact act be his trump card. Nevertheless, both Poroshenko and Zelensky, as well as many other candidates, use tried-and-true techniques in their political struggle. One such technique has the peculiar name “jeansa”—meaning covert political advertising. Is Zelensky’s announcement about his candidacy “jeansa”? According to BBC guidelines, all journalistic materials should have Editorial Justification. And of course, “jeansa” has no such a thing, because it is politicians or business owners (not readers) that benefit from the publication. There are many ways to define “jeansa,” and Ukrainian mass media and NGOs have published a variety of recommendations (IDPO, IMI, Liga.net, Texty.org.ua etc), but all ordinary Ukrainians need do is just compare news from different outlets. In Ukraine, media owners typically set the tone for news on their mass media, and therefore the coverage of different politicians depends on the owner’s political leanings. For instance, on New Year’s Eve the viewing public of one of the leading TV channels in Ukraine, 1+1, watched an announcement by Zelensky that he was going to run in the 2019 presidential elections instead of the traditional New Year’s greeting by the actual President. Did the announcement have editorial justification? In an interview with Liga.net, 1+1 general producer Oleksandr Tkachenko said that it was a way to avoid a boring “Soviet remnant” and show an alternative position. However, in such cases we should ask why did the channel pick this candidate and this time, when many Ukrainians gather near their TV sets. After all, Ukrainian legislation stipulates equal opportunity for all candidates to reach the public. So in the case of the New Year’s announcement, 1+1 gave preference to a certain candidate and disregarded the rights of the audience. Zelensky and, very likely, 1+1 owner Kolomoisky benefited from this. But what about the overall media coverage of Zelensky’s political activity? Zelensky’s case is an interesting one because at first he did not say definitely that he would run for president of Ukraine. Nevertheless, Ukrainian poll-takers included him in their ratings, along with another Ukrainian artist—the musician Sviatoslav Vakarchuk. Of course, both figures are benefiсial for the journalists who cover politics. Artists are constant fodder for the gossip chronicles, so headlines with their names are likely to attract attention. However, balance is crucial here, as excessive attention may lead to distortion of the real pre-election situation. Tsn.ua (TSN) is in the top three most popular electronic editions in Ukraine, owned by Ihor Kolomoisky, a Ukrainian oligarch. 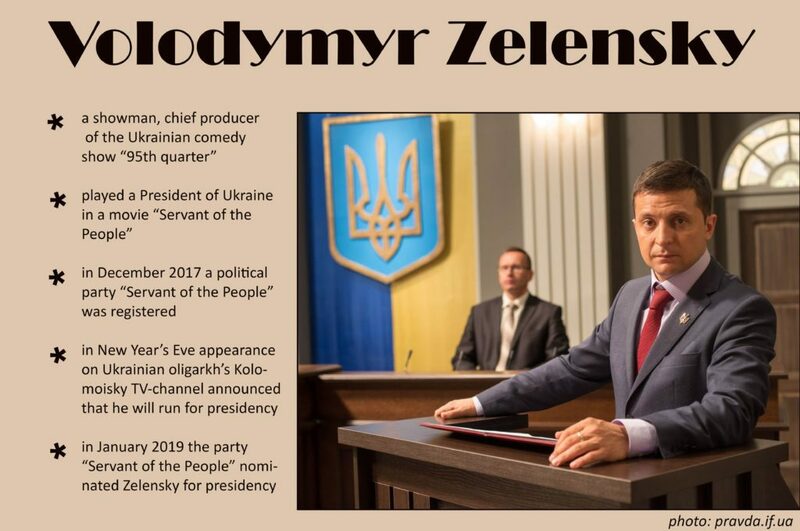 Zelensky’s TV show is broadcast on Kolomoisky’s channel 1+1, and the comedian is overwhelmingly perceived as a Kolomoisky’s candidate. However, both Zelensky and Kolomoisky deny this. Segodnya.ua (Segodnya) is also in the top 3 most popular outlets, but the news policy of this site is different because of its owner, another Ukrainian oligarch—Rinat Akhmetov, who used to be connected to Yanukovych regime but decided after the Euromaidan to stay in Ukraine. According to different polls, Akhmetov supports Oleksandr Vilkul and Oleh Liashko as future presidents. And his TV-channels are loyal to the incumbent. Pravda.com.ua (Pravda) is only eleventh in the rating, but is independent, having been founded by a well-known journalist, Heorhi Gongadze. After he was later murdered, founding editor Olena Prytula took over ownership of the site. Thus, using these news outlets we may simply compare texts about Zelensky and define what items about him are “jeansa.” In all the news items (a total of 99) we looked for a news peg—the reason for publishing and/or a connection of the news item with other significant events of a day. Zelensky’s political activity and statements—given preference or avoided? Zelensky’s activity and statements are covered as news, on a priority basis, by two sites, TSN and Pravda, while Segodnya prefers analytics and overviews. This is an interesting distinction, because in the news format journalists write predominantly about one hero or one subject, whereas in an overview or analytical report the writer compares several candidates and doesn’t focus on any one of them specifically. For example, both TSN and Pravda posted several news texts about Zelensky’s registration at the Central Electoral Commission, while Segodnya covered this event in an overview, mentioning several candidates besides Zelensky who also registered that day. It is important to note that Pravda also wrote about another statement made by Zelensky in the interview: he said that he is against the war in the Donbas and is ready to make a deal with anyone to end it, even the devil. Meanwhile, TSN did not publish this detail, perhaps because the statement would be perceived as controversial given the pro-Ukrainian rhetoric of this site (and of all Kolomoisky’s channels). In addition, we have one more observation about Zelensky’s statements. On 17 January the program Skhemy (Schemes)—an investigative journalism project of Radio Liberty Ukraine and the public broadcaster UA:First—posted a text about Zelensky’s business interests in Russia. TSN mentioned the investigative report only once, denying the allegation. After that, Zelensky admitted it, and TSN posted six texts, where he tries with the help of his lawyer to justify his Russian business and minimize the harm to his reputation. Meanwhile, Pravda reported on a number of different aspects of the Skhemy investigation, posting three news items about it and three texts with Zelensky’s reaction: the denial, the justification, and information that he is going to quit the company. Remarkably, Segodnya didn’t mention the investigation at all. a politician appearing on TV in a clown costume (presumably because of Zelensky’s announcement about running for the presidency). Ratings: Who will be second—Poroshenko, Liashko, or Zelensky? TSN has posted plenty of items mentioning Zelensky in headlines or subheadings. Sometimes the site adds its own commentaries, thus violating news reporting standards: “An impressive poll: Zelensky on a breakaway, increasing his rating compared to Poroshenko” (the comparison between Zelensky and Poroshenko speaks volumes, given that the oligarch Kolomoisky is feuding with Poroshenko); “Pollsters say Zelensky rating is phenomenal,” etc. In addition, TSN maintains Zelensky, Tymoshenko, and Poroshenko in the headlines—the reader should keep this trio in mind. Meanwhile, Segodnya names Tymoshenko, Poroshenko, and Liashko in its ratings. There are also news items about Liashko, who “will go on to the second round of elections,” and about “increasing ratings” for Poroshenko. Zelensky is mentioned in a post dated 28 December, but his rating is not specified. In contrast, Pravda adds other candidates in its headlines and subheadings. However, the difference between the ratings percentages it publishes is extremely small. Sometimes this can be a cause for manipulation: in the majority of ratings Tymoshenko is in first place, while the candidate in second place may differ. According to Segodnya it is Poroshenko or Liashko, whereas TSN predicts a second round for Zelensky. Of course, the news outlets cite different polling companies. Charity and insults: Is anyone angry with Zelensky? As for insults and discreditation, on 1 January Zelensky claimed that his site had been hacked, and TSN posted two news items about it. Then, on 11 January a member of Zelensky’s party stated that there had been an attempt to organize a fake protest on behalf of their party. Notably, the text cited only one source, so obviously the information was not verified. Regardless, information about charity events and insults that were published by only one news outlet loyal to the candidate cannot be perceived as serious news. Before the announcement of his candidacy, TSN journalists used intrigue with repeated reporting of Zelensky musing about his presidency, thus cultivating a strong interest in his persona. Publishing ratings with “the three leaders of the presidential race” Tymoshenko, Poroshenko, and Zelensky intended to lead the public to the conclusion that Zelensky is a serious contender among experienced Ukrainian politicians. Repetition was also used after the investigation about his Russian business. And in “jeansa texts” about Zelensky’s charitable events, readers were told that although Zelensky is rich and successful, he cares about Ukrainian veterans and sick children. On the other hand, Segodnya kept silent about Zelensky’s ratings and Russian business, and tried to show him in the company of other Ukrainian politicians. The actor’s lack of experience was even criticized: “At the Central Electoral Commission he was a showman, not a politician.” The total number of postings on each news site speaks volumes: 40–49 items on TSN and Pravda and only 9 on Segodnya. So Zelensky’s popularity could be used in a headline in order to attract attention to a news site, but Segodnya refrained from exploiting it in this way. The two more popular news outlets don not present the whole picture, and reasonable readers should seek some additional facts and commentaries. Pravda’s coverage of Zelensky is more complete and wide-ranging; however, the newer items are not receiving that much attention. Unfortunately, the rhetoric of change has been repeatedly discredited during Ukrainian elections. It’s a pity that Zelensky—a candidate who definitely has advantages such as popularity, charisma, recognizability, and creativity—is using the manipulative techniques of experienced politicians in the Kuchma and Yanukovych eras in his battle for the presidency of Ukraine.